• Minimum stock control and inventory overview. • Transfer items between warehouses and /or storage spaces. • Ability to correct the current items stock. • Detailed warehouse report as PDF, Word, Excel or Email. 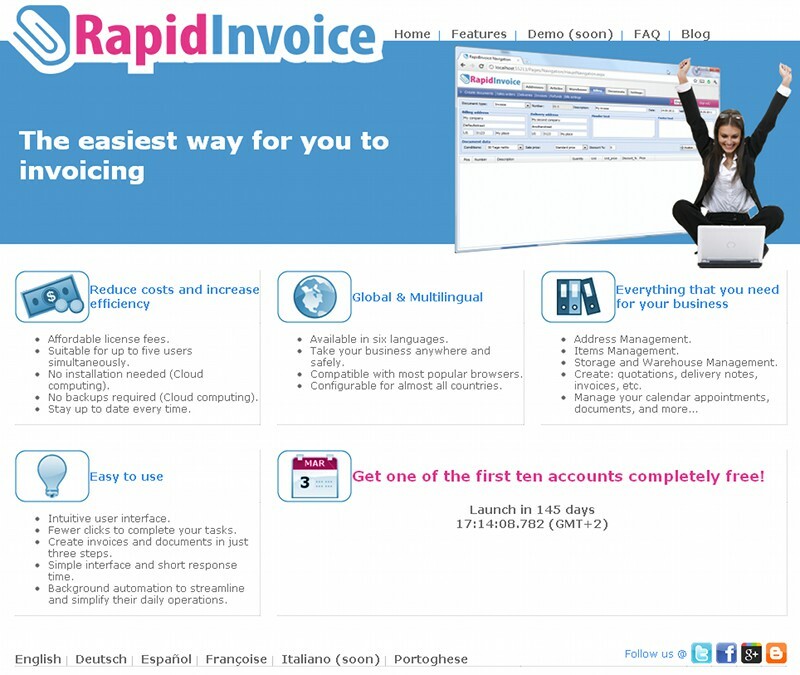 • Graphical user interface and documents in six languages. • Several document templates for offers, purchase orders, sales orders, invoices, etc. • Ability to add your own company logo in the head of the document. • Add your own tax in accordance with your own country's laws. • Selection from your own country's currency. 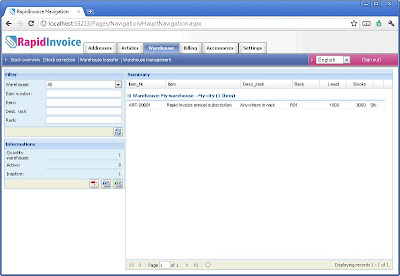 • Ability to connect your own Email account through POP3 to send documents. • Creating and defining your own documents and articles numbering. • Mapping your own country’s currency, date format and sales price rounding format. • Up to five users can work simultaneously. • 99.8% of time available thanks second backup Internet connection. • Available and accessible from anywhere. • High browser compatibility: Microsoft Explorer (also Windows Mobile Explorer), Google Chrome, Apple Safari (also iPhone and iPad Safari), Firefox, Opera and RockMelt. Rapid Invoice - create quotes, purchase orders, sales orders, delivery notes, invoices, etc. 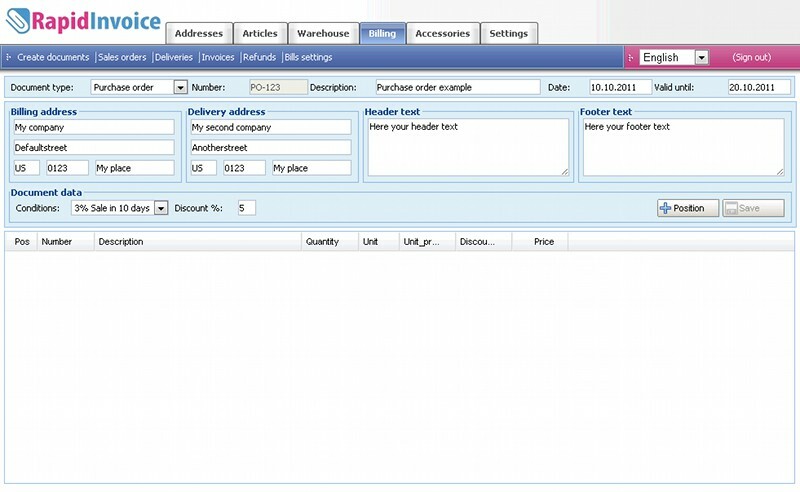 Create all your documents: quotes, purchase orders, sales orders, delivery notes, invoices, etc. Automatic or manual numbering of documents. Ability to assign two different document dates, e.g. creation date and expiration date. Ability to add a document description. 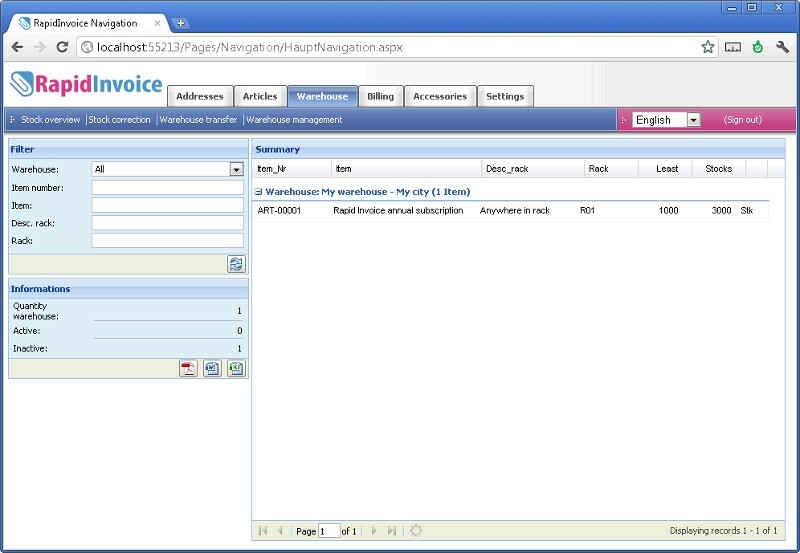 Assign different shipping address and billing address. Automatic setting of customer payment terms (modifiable). Ability to assign amount discounts. Add headers and footers to your document. Automatic setting of sales prices by position. Workflows for all document steps, e.g. offer to order, purchase order to invoice, etc. Your own company logo in the head of the document. Export documents as PDF, Word, Excel or Email.